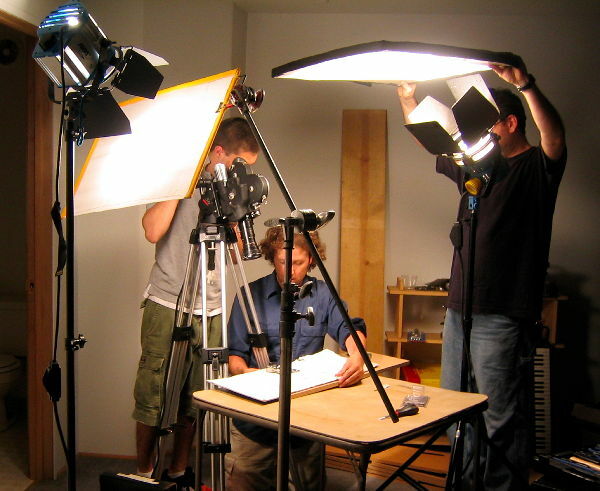 Also known as lighting technician, is the person that together with the other sparks, forms the lighting crew and his responsibilities vary according to the size and the type of the production: from supervising the power supplies options on a small documentary right to handling gigantics lights in blockbuster productions. A good spark is an incredible save of time and money and in the same way it happens for a lot of positions in the film industry, even though it seems a quite easy and physical job, it requires way more than an healthy body and a leatherman multi tool knife. He needs to know perfectly how each and every piece of gear works, keep it clean and in order so the production can be as fast as it gets. Plus, and maybe more important, they are the ones that deal with electricity on set so they have top responsibility in matter of safety, specially when shooting on real locations, where it is paramount to be careful and aware of every possible danger related with power supply. We can provide full spark crews or single lighting electricians so you can complete your own crew, and we can vouch for the experience and the reliability on each and every one of them.